In "That Which Survives"[TOS3] the Enterprise encounters a peculiar, unnamed world. Described as hollow later in the episode (and full of replicas of one of the actresses to play Catwoman in the 60's), we are told the Catwoman planet reads as only thousands of years old, is approximately the size of Earth's moon, yet has a mass and atmosphere comparable to Earth's. SPOCK: I suggest no supernatural explanation, Captain. I merely point out that the facts do not fit any known categories of planets. KIRK: Let's take the facts one by one. That should explain something. SPOCK: Undoubtedly. The age of this planet would seem to be only a few thousand years. It would be impossible for vegetation to evolve in so short a period. KIRK: Its size is approximately that of Earth's moon. SPOCK: But its mass and atmosphere are similar to Earth. KIRK: That would be difficult to explain. SPOCK: It would be impossible, Captain. An atmosphere could not evolve in so short a period of time. KIRK: And yet it has. SPOCK: Evidently. But the inconsistencies are so compounded as to present a seemingly impossible phenomenon. KIRK: But a fascinating one, Mister Spock. SULU: That's the same red rock. KIRK: My phaser didn't cut through it. MCCOY: Whatever it is, it has a mighty high melting point. KIRK: Eight thousand degrees centigrade. It looks like igneous rock, but infinitely denser. In other words, Kirk seemed to believe the alloy had a melting point of 8000 degrees, presumably because it would be somewhat superior to what is phaser would be expected to generate. And further, while it looked like simple igneous rock (which has an average density of around 3000 kg/m^3), Kirk believed it was "infinitely" more dense ... an exaggeration, naturally, but not the sort of thing one would say in lieu of 'just a wee bit'. Note also Kirk's surprise at not cutting through the 'rock'. He clearly expected his brief shot to either cut the grave or at least get it good and started, not merely pock-mark the surface (and in a rectangle, no less!). But instead, the lieutenant is buried beneath some other gray rocks scattered about the surface. While the Catwoman planet is identified as being hollow, we are not told any details of the depth of the alloy layer. However, we can get some estimates for the planet as a whole. After all, if it is approximately the size of the moon then it is around 3500km in diameter, or around a quarter that of Earth. But the real story is in volume. The moon's volume is about 2.1958×1010 km3 ... a mere two percent of the volume of the Earth. This means that for the planet to have the same mass as Earth, it must be about fifty times more dense than the average density of Earth. Earth's total density is about 5,500 kg/m^3, meaning the Catwoman planet density should be somewhere in the range of 275,000 kg/m^3! Um, yeah. That's a lot. Like, crazypants a lot. That's 275 times denser than water, and almost 100 times denser than the igneous rock average from earlier (making Kirk's "infinitely" close enough). It's also 35 times denser than steel, and almost twice the density at the core of the sun! Suffice it to say, you won't see an element of that density anywhere on the periodic table, or a material like that on modern Earth outside of a collider. And the scary thing is that it is alloyed with osmium, one of the densest elements known at a 'mere' 22,500 kg/m^3, twice the density of lead. If the ratio of diburnium and osmium was 50/50 by volume, diburnium would be almost twice as dense as our 275,000 kg/m^3 figure! And that doesn't even touch on the hollowness. SPOCK: Fascinating material. Similar to diburnium, but considerably more dense. I doubt even phaser fire could disturb its molecular structure. SPOCK: Whatever it is we must do, it is impossible. SPOCK: This material surrounding the projector is the same as I discovered on the planet. Readings indicate it is impervious to any of our weapons. We cannot penetrate the casing to get to the machine. If the material is considerably more dense than 275,000kg/m^3 (or even higher depending on the osmium content on the Catwoman planet), then it is no wonder the phasers couldn't begin to touch it! If it was a cool million kilograms per cubic meter, it would only be 1000 times less dense than a white dwarf! There is, however, one problem with the information we are provided. The Moon has one-sixth of Earth's gravity ... 16% or so ... despite only having 1.2% of its mass. The reason the gravity is so high is that the radius is so small. At Earth's radius ... that is to say, if you could make a massless surface to stand on at a distance from the core equal to the distance of Earth's surface to Earth's core ... the gravity would be 1.2% of Earth's, or around 1/83rd instead of 1/6th. One easy solution would be to have the world be in a tidal lock with a nearby massive but dim sun, perhaps something like a brown dwarf, but unfortunately this won't work . . . the planet has at least a partial day-night cycle of greater and lesser studio lighting and sky color. We might then suppose instead a massive, dense moon in a geosynchronous orbit ... this works rather better, inasmuch as it keeps the light levels as high as they were observed in the supposedly night-time scenes, though of course there is no mention of a moon nor is it spotted in Enterprise orbit scenes. However, the moon would have to be even more interesting than the planet itself to have enough gravity at a distance to subtract up to 12g. In any case, the presence of an Earth-normal atmosphere as Spock also mentioned does constrain us. Higher gravity equals a higher atmospheric density, but if the atmosphere is Earth-like then the gravity should be, as well. We can fudge a little here and assume he simply meant the atmosphere was the same at the surface, meaning it was several times thinner under normal gravitational circumstances, but then we're still faced with the gravity problem of Kirk and company running around effortlessly while weighing something like 2000 pounds, a feat Shatner wouldn't perform again until Generations. Even fudging the numbers a bit ... 1.33 Moon radii and 0.66 Earth masses, for instance ... we still come out just shy of 5g. And to match the visuals I'd want no more than 1.5g on the highest end. Even pretending the densest part of the planet is on the opposing surface (thus faking 2 Moon radii out of it, despite whatever odd atmospheric effects this might cause), we still only get down to 2.2g. The gravity problem is significant, and we are constrained to the idea that whatever causes the beamdown site to have 1g should be a permanent phenomenon. After all, when the Enterprise was thought lost, Kirk's concerns were food and water, not the notion of having something happen that would subject them to 13+ times Earth's gravity at some point. It seems to me the best solution is to add a little extra complexity to the stellar dwarf idea, such as the dwarf itself having a dim side that allows for the brighter/darker cycle. This has one delightful side benefit . . . it also would mean that we could say the Catwoman Planet orbited the Riddler Star . . . here referring to the fact that the guy who played the Riddler in the 60's also played one of the last two folks from Cheron from "Let That Be Your Last Battlefield", a world where the people's skin was white on one side and black on the other. The benefits here are tremendous from an explanatory perspective. For instance, Spock specifically noted a mass and atmosphere similar to Earth's. Earlier we tried to fudge this last point, but if we don't fudge it then we ought to have a planet with an atmosphere several times denser than ours at the surface. But if a significant area of the planet shows much less gravity due to the presence of a nearby star to which it is tidally locked, then a large part of the atmosphere would be subject to Earth-ocean-tidal-esque forces and perhaps not seem so dense. The only possible glitch I see is that I have no idea what this would do insofar as wind patterns. Should you find the Riddler Star idea distasteful, bear in mind that most alternatives are unpleasant, either from Occam's perspective or in other ways. We could suppose all sorts of off-the-wall ideas, such as a localized or near-surface 'natural' anti-grav effect (one would think that would have been worth a mention), or one projected from the ship (a temporary condition, one would think, after the ship's abrupt departure, and an incredible can of worms to open ... not to mention the fact that the tremor felt at beamdown would've had an obvious cause, rather than being a mystery). 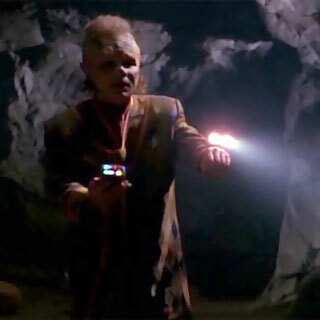 There could've been an also-beamed-down gravity modifier (same notation), or a conveniently invisible bio-augmentation-handwavium apparatus worn by the crew (which would presumably be a doodad that could run out of gas, making it another of Kirk's concerns ... see also "Melora"[DS9]). Another idea is of a subspace field of some kind, with Spock having reported the unadjusted mass . . . but the planet is specified to not even have a magnetic field, so one would think a high-energy subspace field would have been worth a note. The only other alternative I can see is to simply dismiss the statements of Spock, Kirk, Sulu (who identified the planet's composition), and others, treating them all as dim-witted fools who didn't know what the devil they were talking about. I'm generally no fan of this analysis method. It may be the standard approach by Star Wars tech inflationists, but that doesn't mean it's any good, and indeed the opposite is indicated. Their approach is to disregard Trek character statements at the first sign of an excuse to do so, so that they may then insert their own claptrap unimpeded. After all, they became SW tech inflationists in order to twist the fusion and steel of Star Wars canon into something that would "make it a better comparison to Trek", so it only follows that they would be Trek deflationists at the same expense of canon. Literally, you'd have to have Spock getting the mass wrong, Kirk getting the reason his phaser had an issue wrong, Sulu being wrong about the planet, and even McCoy and D'Amato saying some dumb things in there. And, of course, they'd all be working from balky sensor equipment on ship or in hand. That just doesn't mesh. If the entire planet's gravity was 1g, then the mass of the world would be 7.5% Earth's mass, makng the density fairly close to osmium. So Kirk's line about "infinitely denser" would actually only reflect a difference of six or seven times, and Spock, who spends the entire episode badgering people about precision, would be off by 92.5%. In other words, you have to throw out all sense of any reliability in Trek, making the entire Trek tech analysis field a pointless enterprise (even moreso than just because we should all go outside and soak in some sunshine). That's a bad idea anyway, but also for another reason . . . the things you'd be tossing out are all consistent with each other. Kirk's analysis, Spock's report, and so on all point toward the same sort of densities and physical properties. Only the observed gravity at the beamdown site suggests anything different. And the place obviously has a sun of some sort, so it becomes the most likely explanatory culprit. Surefire's come out with a tactical light that instead of being mounted on the weapon, head, or just being handheld, is worn on the wrist. And I'm all like "wait, so Neelix is tacti-cool now?" No. No he is not, but only because Neelix cannot be anything with the word "cool" in it.